BAM! There it is, the long awaited Horological Machine #7 is finally amongst us. And boy, what a crazy cool creation it is. 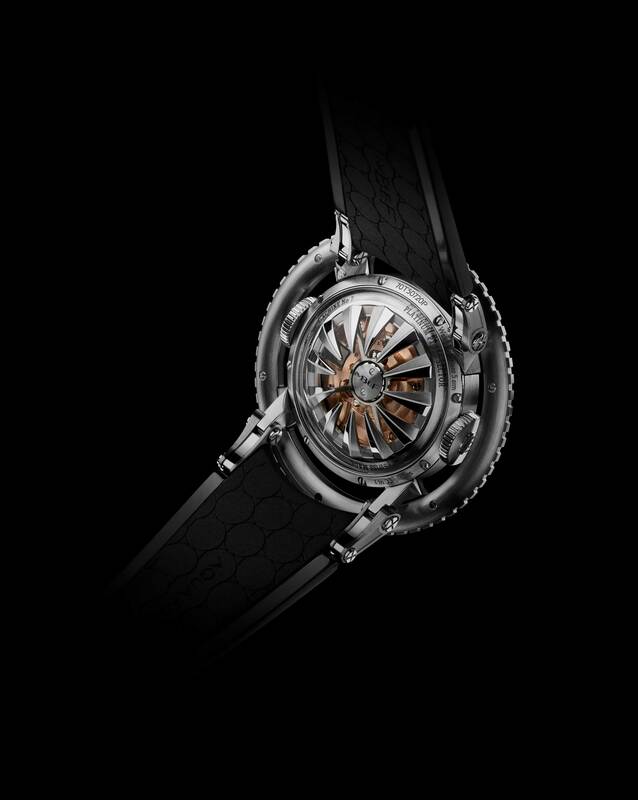 It is always a delight to sit back and wait for the special models launched during SIHH, but this MB&F absolutely blows us away. 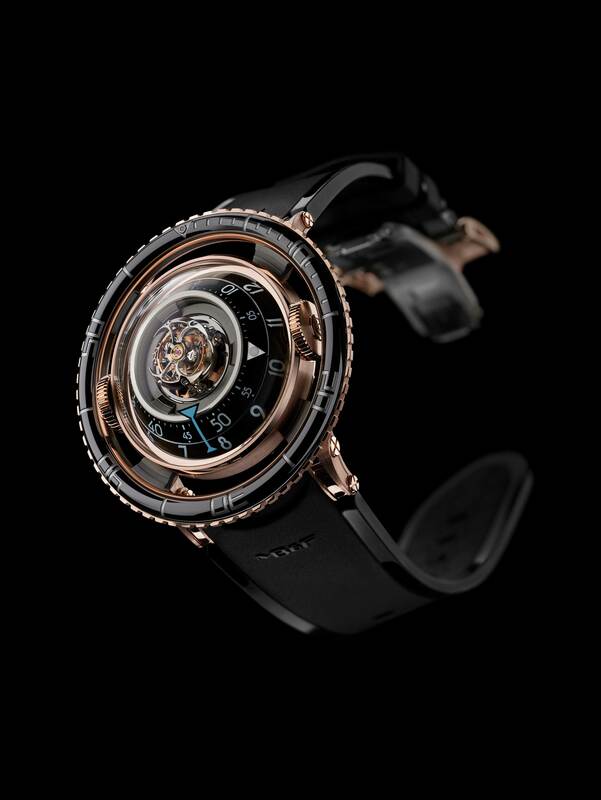 Maybe you’ve noticed it, maybe you didn’t – but here at House of Chronos, we are very fond of the MB&F creations. Now, I say this like it’s something that’s not very common but that would be strange considered the ingenuity that pairs an MB&F creation. After all, if you don’t respect or like a creation made by Mr. Busser and Friends, you probably don’t get what they are doing. If you don’t get what they are doing, I would strongly suggest you dive into the history of MB&F and the ‘why’ in why they do what they do. To be honest, it’s the first jellyfish I can appreciate. As a kid, the jellyfishes that washed ashore always scared me, they weren’t as graceful as the ones that we see in Planet Earth. So, no matter how intrigued David Attenborough is about those jellyfish, it was hard for me to see the beauty. Anyhow, this jellyfish is from a whole different world. It’s very graceful and sits very elegant on ones wrist. Something you should try with a real one – they sting you know. The whole design of this piece of art is inspired by the elegant shapes and movement of jellyfish. The whole creation looks like a ‘bubble’ with tentacles strapped to it. Apparently, the structure of a jellyfish’s brain looks exactly the way the hour and minute rings look in the HM7. As symmetrical radially placed rings. 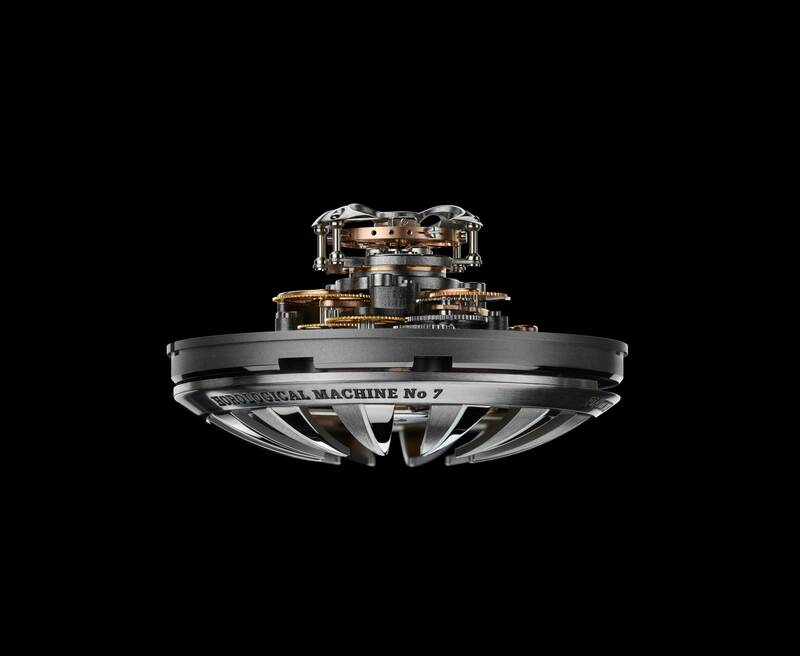 What’s very cool in the design of this Horological Machine is the way they placed and assembled the movement. Known from pocket watches that date two centuries ago, the movement of the HM7 is placed vertically, rather than horizontally. On top, you’ll find the floating tourbillon finished with the characteristic axe shape. 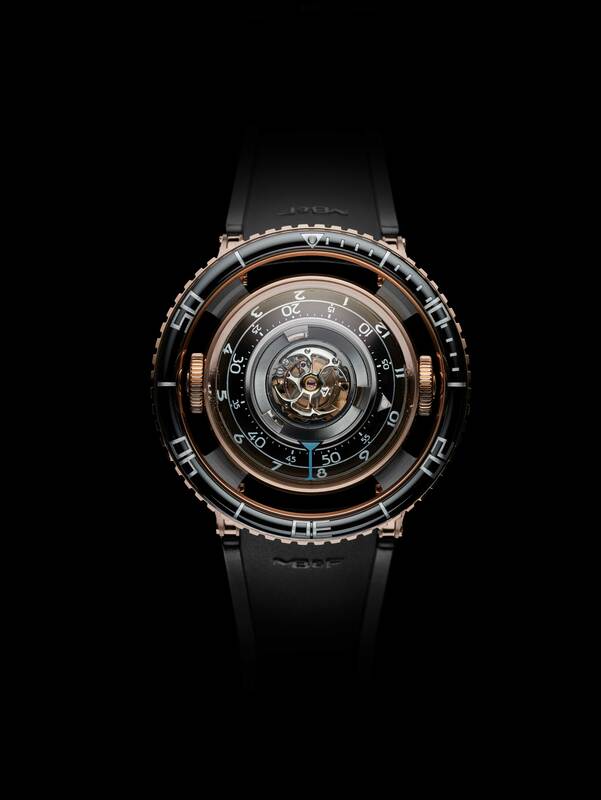 One we’ve seen more than once in MB&F pieces. All of this is surrounded by two high-domed hemispheres made out of sapphire. Giving the wearer and admirer the perfect visibility on this beautiful creation. Another unusual design-feature can be found in the ceramic bezel. As we all know, dive watches or watches with no fear of a bit water, have bezel. In most cases, this is an unidirectional bezel, so is the one on the HM7. However, what makes this bezel different from others is the fact that it’s not placed ‘on top’ of the case. No, this bezel floats around the case – looks strange and refreshing at the same time. 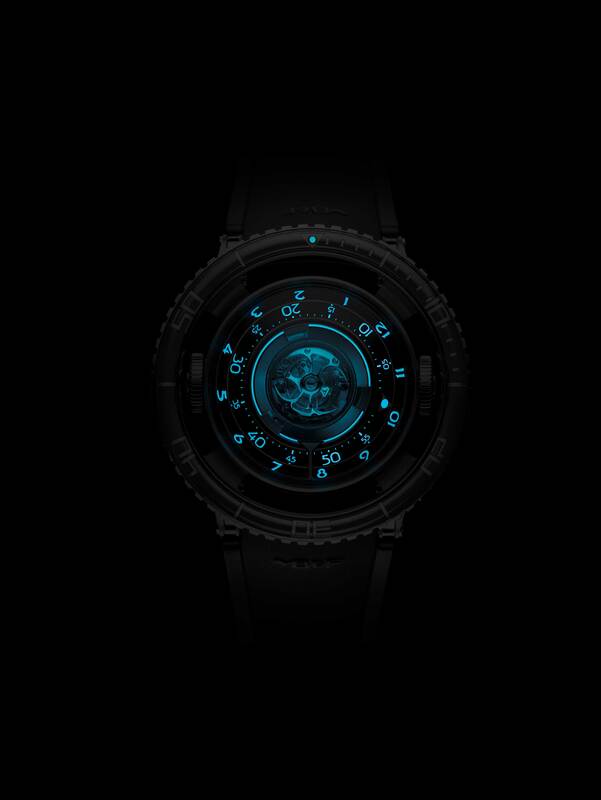 But then again, we’re not paying attention to an MB&F to see if there are any ‘normal’ aspects. As we all know, from movies or deep-sea diving, jellyfish are made out of SuperLuminova. They give other sea-creatures the ability to spot traffic in the dark hours of the ocean. So it’s only fitting that the HM7 is luminous too. 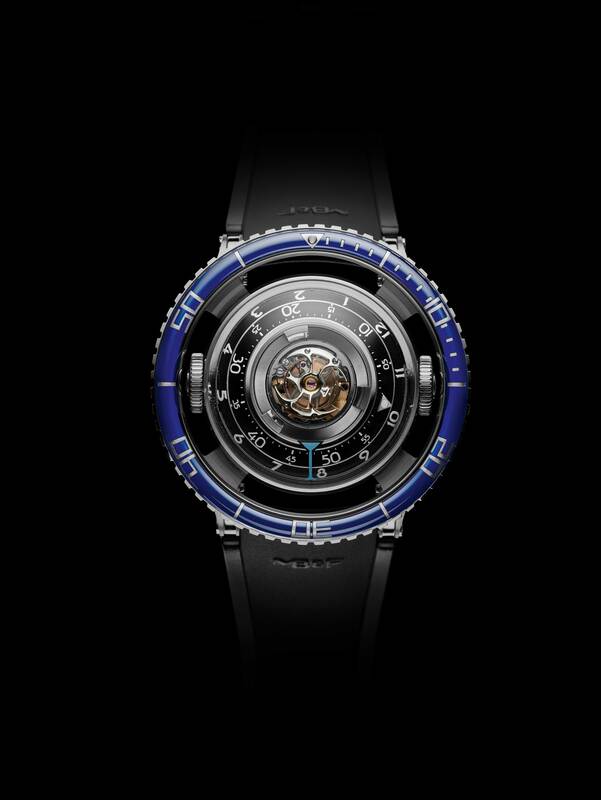 It is, the numerals are luminous and the inside of the movement is too – resulting in a tourbillon movement clearly visible in the night-time. It’s hard for me to write this article, since it’s almost impossible to write about such a machine. You can’t explain details that can only be absorbed and understand with your own eyes. Therefore, I will not make it to complicated and leave it up to the pictures to tell the story. What’s important to state is the fact that there will be a total of 99 pieces created. 33 of which will be made out of grade 5 titanium with a blue bezel and 66 pieces will be made out of 18k 5N+ Red Gold and a black bezel. 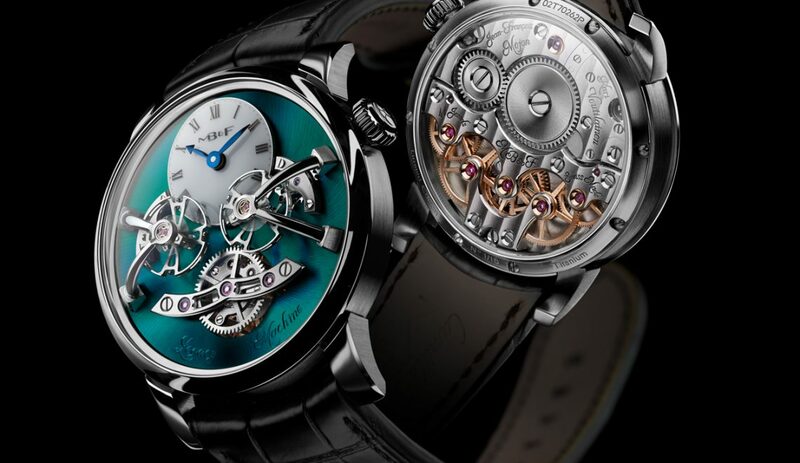 Personally I would go for the one in Red Gold but hey, I can only dream of owning an MB&F one day. Let alone having the luxury of choosing which version I would like to have. 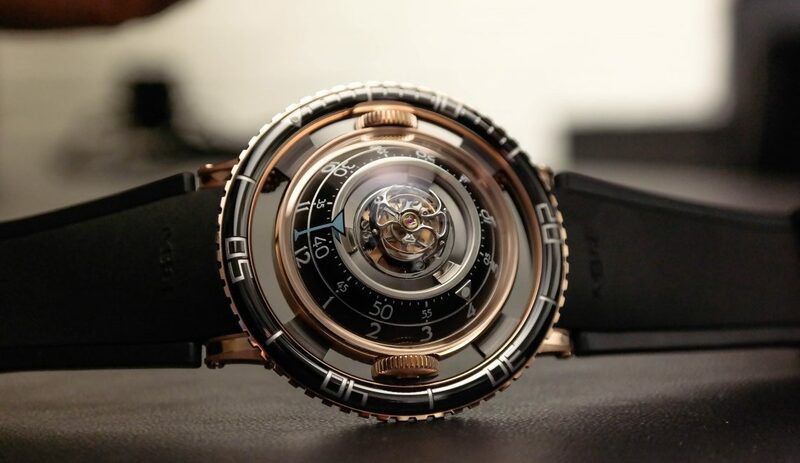 I think MB&F did another great job, another outstanding creation underlining why they are such a special brand. A brand that’s needed in this industry full of copycats and boring grey old socks. I love it!